It’s not quite what was originally planned – but it still put a smile on kids’ faces. 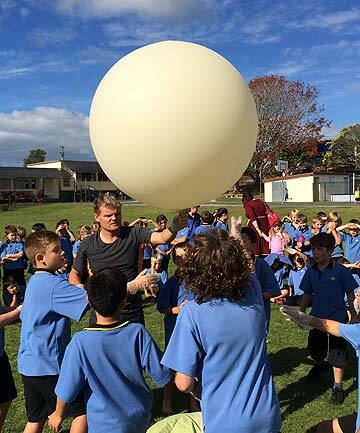 Torbay School pupils gathered to watch the release of a weather balloon last Tuesday, courtesy of the MetService. The launch was organised after earlier plans to send a modified balloon to the edge of space were halted. Pupils spent last year working on the original scheme to put a helium-filled weather balloon 25,000 metres above the earth with attached equipment taking images, recording information and sending a live video feed as it went. But the project is on hold after Airways, the state owned company controlling aircraft airspace, belatedly decided the bigger than usual weather balloon needed extra equipment before it could move safely through busy airspace. However, the school can’t afford to buy the $7000 transponder that would allow authorities to track its whereabouts. “We’re sorry that we can’t help, but safety must be our top priority, ” Airways communications head Philippa Sellens says. The balloon released last week carried none of equipment intended for the first flight and was small enough to not require Airways clearance. The MetService organised the gesture after hearing of Torbay’s plight.